With a view of a shimmering stream and the words: "It's tingling fresh," Britain was introduced to its first television advert on ITV's launch night exactly 60 years ago. Brian Palmer, who made the ad, explains how it came about - and why commercials were so controversial. 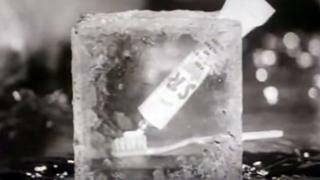 The ad's opening shot zoomed in to show a toothbrush and a tube of Gibbs SR toothpaste apparently encased in a block of ice, before a model demonstrated her brushing prowess and a bar chart warned of the dangers of gum disease. It looks primitive now, but was revolutionary in the UK at the time. And it was highly contentious, with some politicians and grandees warning that TV adverts would somehow debase society. Brian Palmer, a 26-year-old advertising executive at the time, had no such qualms. Did you know what would work on TV and what wouldn't? None of us knew very much about it at all. It's hard to imagine now, but it was completely new to England. The only thing we had to guide us was the way they did it in America, which was actually rather different because they had sponsored programmes and we only had spot ads. So I had a minute to try and tell a little story that would persuade people to buy toothpaste. Didn't it contain the first advertising trick - the block of ice in the close-ups wasn't actually ice? That's true, because it melted in the lights. The lights they used in those days were very hot indeed, and in close-up the block of ice would have melted very quickly. So in the close-ups we used a plastic block. We didn't really know what we were doing, and to some extent we were learning on the job, and so were the technicians. Did you know it was going to be the first advert? No I didn't. Our clients were Unilever and they had booked quite a lot of advertisements in the first night, but you couldn't book specific spots at that time. The order was drawn out of a hat, I believe, so it was pure chance. I was one of the very few people in England with a television set. I had not long been married and I had a little flat in Notting Hill Gate and gathered a few friends and colleagues to watch the first night of commercial television. And imagine my surprise when suddenly there was this starburst on the screen and it was my ad. I was thrilled to bits. I was completely amazed - and a bit frightened. Would it be all right? Did toothpaste sales rocket up as a result? I'm not sure they rocketed up, because not many people had ITV in those days. Not many people had television at all. But yes, it did have a favourable effect on sales. Were you convinced by the power of television as an advertising medium? Very much so. I bet my career on it because, when it was first mooted about a year before, I said to my ultimate boss that I'd like to specialise in that medium. My immediate boss, who was a great friend, said: "Brian, I think you're crazy. It will never be a major medium." But I believed very much and still believe that it was and is an enormously powerful medium. Was there a debate over whether TV advertising was a good thing? There was a tremendous debate. It was terribly attacked. Even a Labour MP said it was disgraceful because it would make people want things that they couldn't afford. You have no idea of the intensity of the debate. It really was very controversial. How does the ad compare to modern TV adverts? It looks like a slide presentation today. It's slow, it's a bit ponderous, and it has none of the attributes that we've come to accept in modern advertising, and in modern television. The attention span of the audience today is much shorter and the terms of reference are much wider. We had to either straightforwardly explain what we were trying to do or try to entertain people into being interested. What do you think of adverts today? Because the media has become so fragmented, the ads have become very specialised in lots of ways. A lot of them are not meant for me, and I don't understand them. They've got references to films I haven't seen or celebrities I don't know about. So I find a lot of advertising quite hard to understand. Do you have a favourite TV advert? It would be the one for Volkswagen where it's a terrible snowy day, and, suddenly, out of the snow, you hear a car starting up and it emerges as a Volkswagen. The line is: "Do you ever think how the man who drives the snow-plough gets to the snow-plough?"